Gaming consoles, Phones and HD TVs are up for grabs at Shopee's Orange Day Sale! 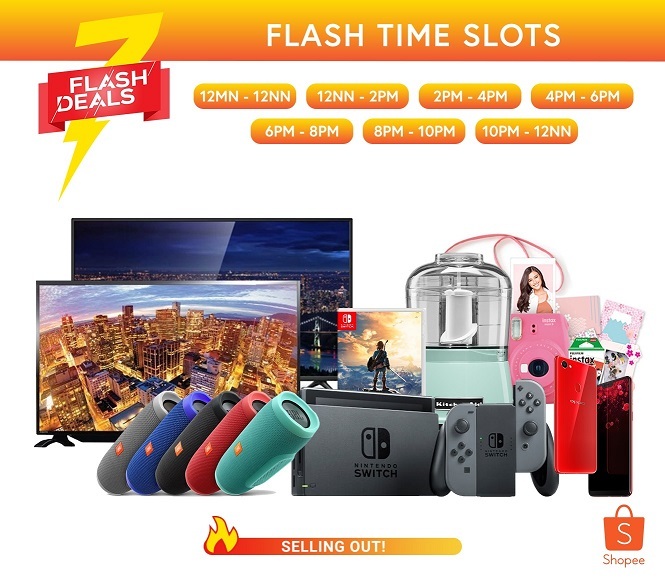 To celebrate its monthly Orange Day campaign, Shopee, the leading e-commerce platform in Southeast Asia and Taiwan, launches the Flash 7 on July 13 with seven flash deals instead of the usual three a day. Featuring massive limited-time discounts on premium products such as the Nintendo Switch and Smart TVs, the campaign will also include a diverse array of products from various categories like Electronics, Home Appliances, and Mobiles and Gadgets. With Sharp’s AQUOS 32” LE185M LED TV, you can dive right into your favourite movies and TV shows. With advanced image processing, a crisp HD display, and top-notch LED technology, the Sharp AQUOS 32” LED185M LED TV promises an immersive entertainment experience for only P7,699. The first home gaming console capable of transforming into a portable gaming device, it’s no wonder why the Nintendo Switch is on everybody’s wishlist in 2018. If you’re someone who’s always out and about, Shopee’s Orange Day Sale is the sign you need to get your hands on a Switch for only P17,999! Upgrade your home entertainment system with the latest Toshiba 32” LED TV and bring your stay-home nights to the next level. With a display able to support viewing angles up to 178 degrees, you won’t miss any of the onscreen action no matter where you sit. Pamper yourself with a supreme entertainment experience for only P7,499 during Shopee’s Orange Day Sale. Besides the coolest gaming consoles and crystal-clear TVs, Shopee’s Orange Day Sale also features the all-new Oppo F7 for shoppers itching for a new phone. Packing an ultra-HD camera mode and stocked with the latest specs, it is sure to place you at the centre of attention among your friends and family. To sweeten an already awesome deal, buy the Oppo 7 at Shopee’s Orange Day Sale for P17,999 and receive a Bluetooth music lamp for free! Discover the all-new wireless JBL Charge 3 you can carry anywhere to savour your favourite tunes. Packing a powerful stereo and a durable build with waterproof fabrics, the JBL Charge 3 delivers a satisfying audio experience in different vibrant colours. Get it now for only P5,999! Cooking has never been easier with the KitchenAid Food Chopper. For only P2,495, you can now quickly chop or puree ingredients from your favorite recipes. It is convenient for everyday use in the kitchen and will surely be one of your favorite household items. What makes the Fujifilm Instax Mini 9 Sakura Special Kit Instant Camera special is its close-up lens attachment, which allows you to shoot your subject from up to 35cm away. It also automatically detects the best brightness levels for a shot, making it easier when taking photos in different environments. With its suite of smart functions, the Fujifilm Instax Mini at P3,779 is the perfect weapon for both expert photographers or just casual shooters looking for a versatile polaroid camera. 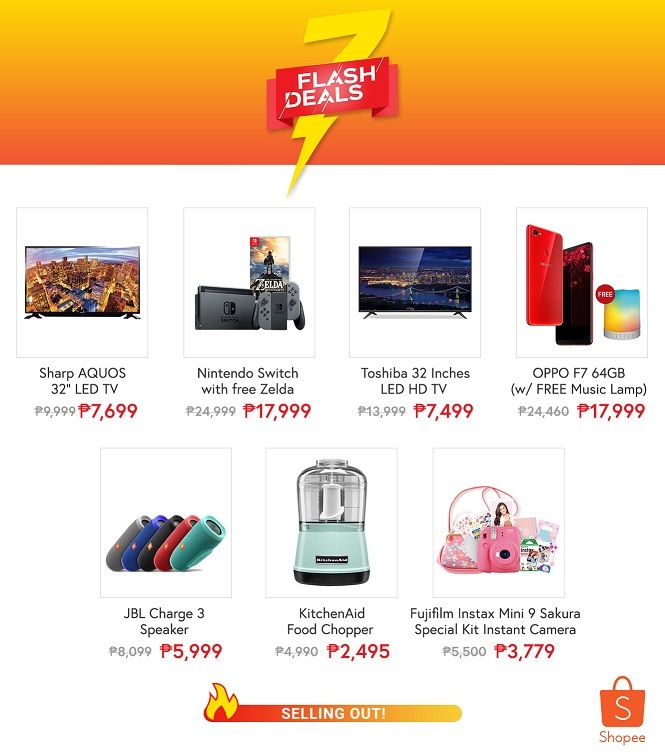 Aside from a wave of flash deals on July 13, Shopee’s Orange Day celebration from July 13 to 15 promises tons of other attractive promotions, such as two-for-one deals, vouchers offering up to 150 pesos off, and curated category collections featuring up to 90% discounts on items. For more information about the Orange Day Sale, visit http://shopee.ph/OrangeDayJuly. Download the Shopee app for free on Apple App Store or Google Play Store.